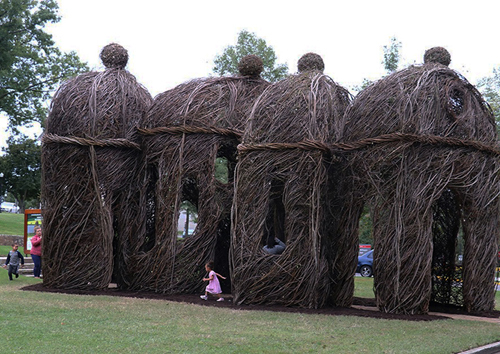 Highbrow is a monumental and interactive sculpture constructed entirely of sticks. Patrick Dougherty and volunteers harvested saplings from local farms. The saplings were stripped of leaves and then wove them together to construct the entire sculpture. Dougherty describes by the structure as gatehouses which intersect and work their way down the walkway. We invite you to visit and walk through the whimsical sculpture located in the front lawn of the Kentucky Museum. The museum has dedicated parking off of Kentucky Street. Click HERE for visitor parking information. Highbrow was made possible by WKU’s Cultural Enhancement Series with support from the Kentucky Museum.